Your boss can limit, or even ban, your cell phone use. Cell phones have become so much a part of people’s lives that it is difficult to imagine how anyone got along before they were invented. At work, your little phone is your connection to the outside world. 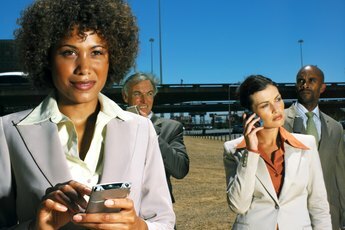 Using your cell phone on the job is a privilege, not a right, however, so abuse of cell phone time could result in the loss of the privilege. Your boss is within his rights to ban your cell phone from work. Even before the arrival of the ubiquitous individual cell phone, employers had to cope with workers who dawdled on personal phone calls. The needs of employees to be in contact with family members must be balanced with the needs of employers to maintain productivity, safety and a professional, efficient workplace. 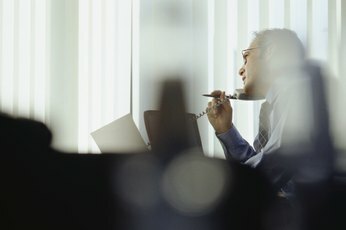 Workers who spend time chatting on personal calls, whether by cell phone or landline, are wasting their employer’s time and costing the company money. Cell phone conversations and noisy ring tones also annoy co-workers and distract them from their own work. As of April, 2013, no laws specifically prohibit employers from banning or limiting cell phone use in the workplace. Your employer can indeed ban your cell phone from work, but only because of a company policy, not a law. Companies may already have policies in place regarding use of company phone lines for personal phone calls. If not, company managers or human resources departments have the right to develop policies regarding personal calls on both cell phones and landlines. Policies should spell out consequences for violations. Check to see if your company has a policy on cell phone use. The company could forbid employees from bringing phones to work all together or could allow calls only from family members and schools in the case of medical or other emergencies. Even if there is no policy, you can keep yourself and your phone out of trouble by observing simple courtesy and common sense. Instruct your family members and friends not to call unless there is a genuinely urgent situation. Set your phone to vibrate rather than ring. During meetings, turn your phone off or set it to divert calls to voicemail. If you must make or take a call, leave the room or speak softly and cut the call short. Don’t interrupt a conversation to take a call. 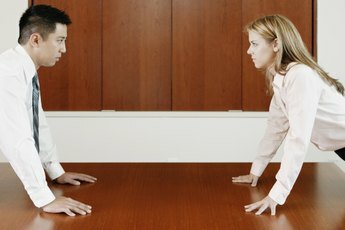 Avoid wasting your time, and company time, on personal conversations, games, Internet surfing, email and texting. If your boss has asked you not to bring your phone to work, or has cautioned you to cut down on using your cell phone during working hours, check the company policy on cell phone use to see if those restrictions are spelled out and if you are in violation. Ask if other employees are similarly restricted and if they are not, find out why. Other managers may be less strict on office cell phone use, but rules should be enforced across the board. 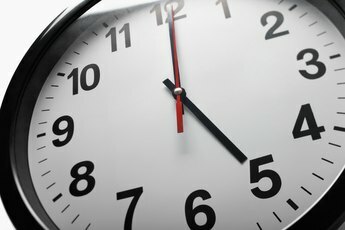 Can My Employer Restrict Me From Other Part-Time Work?